The fourth and last in a series of novels involving the search for lost art. But a new slant here: this novel is for adults. 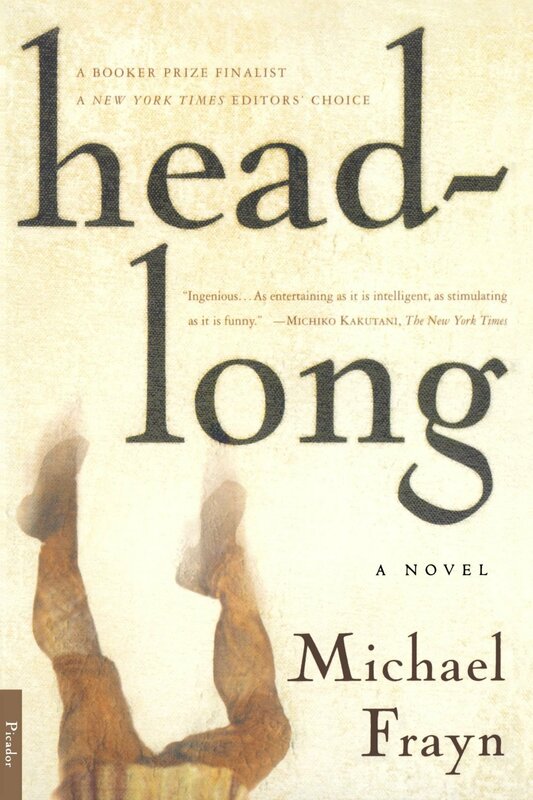 Headlong, Michael Frayn (1999), Picador, 342 pp. Ever since seeing that episode–and I’m amazed that it’s been nearly 50 years, so it’s likely some of you don’t remember it; sorry–I’ve looked for the painting whose world I wouldn’t mind escaping to. Several by Van Gogh, Corot, Matisse, Cezanne; in short, just about any from the late 1800s. 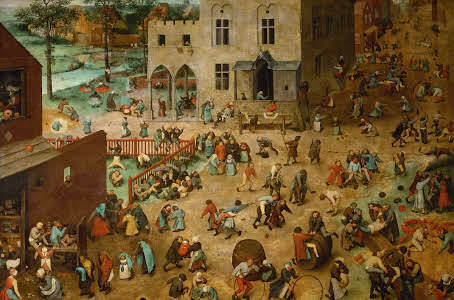 But I’ve also had a soft spot for the works of Pieter Brueghel the Elder (1525-1569). Something about the feel of nature in each of them, even if nature is pushed off to a corner, as in Children’s Games. The people are colorfully dressed, well fed, doing stuff outside. Looks like fun, eh? Well, this is a long way of getting to Frayn’s book, about Martin Clay, a happily married late-20th-century British academic whose life goes haywire when he thinks he’s discovered, in a neighbor’s house, a missing Brueghel masterpiece. Being an academic, he knows what to do next: he reads everything he can find on 16th-century Dutch art, tracks down and visits (as if running through an artwork bucket-list) every Brueghel painting he can afford to get to, and looks for the gap the possible masterpiece might fill. This may be part of why I so enjoyed this book. It’s art history without snarky elitism; or, better still, the elitism gets boffed every time it lifts its snarky head. The conflict for Martin is how to get his hands on the painting he assumes/hopes/prays is by Brueghel, in order to graciously donate it to his nation and thereby garner the respect he feels he’s earned for doing all the grunt work, without tipping his hand to the man who currently owns it. Despite the monetary value of any new Brueghel that reaches the market (over a million pounds, in the 1990s), Martin keeps insisting he isn’t in it for the money. Truly, he isn’t. Part slap-stick, part social commentary, part art-heist, this novel is packed with the comedy you’d expect from the Noises Off playwright. But it’s also an astute analysis of the dangers of any obsession. Frayn’s inspiration for the novel may lie in a controversy that arose a few years before the book was published. 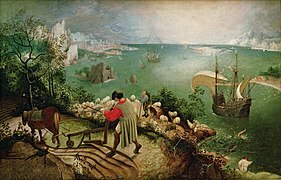 In the mid-1990s, researchers questioned whether Landscape with the Fall of Icarus was, in fact, painted by Pieter Brueghel the Elder (the arguments continue to this day; find an excellent analysis of the painting and the controversy here). The novel’s title refers to the tiny figure of poor Icarus, falling headlong into the sea as life continues around him, no one noticing his death. So it goes. A perfect image for any obsession. PS: You can read W H Auden’s poem, “Musée des Beaux Arts”, here. It’s Auden’s response to seeing Landscape with the Fall of Icarus while in Brussels. This entry was posted in Art, History, Mystery and tagged Michael Frayn, Pieter Breughel the Elder, W H Auden. Bookmark the permalink. I remember reading this a while ago and being enthralled, though naturally cheated at the end (I did so want it all to work out!). The outcome, in retrospect, reminds me a bit of James’ The Aspern Papers in that respect. But I did like the discussion — very non-elitist as you suggest — and now must look at your link to the controversy of the Icarus provenance. Exactly. It would have been nice to think there was one more Brueghel out there for us to enjoy.